This happy porker is ready to eat. He holds a spoon in his right hoof and a fork in his left. 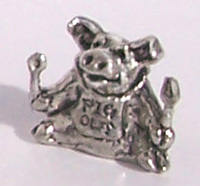 The large bib says "Pig Out" and is tied behind his head with a bow. He has large floppy ears and a curly tail.